Make your e-commerce site go viral by offering your customers a discount if they Facebook Like, Google+1 or Tweet about your site. 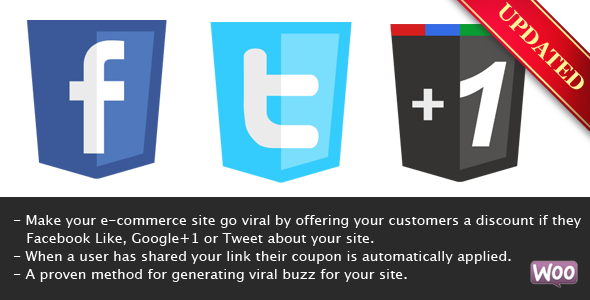 Viral Coupon integrates with WooCommerce to automatically apply a coupon if the user Likes or Shares your link. Viral Coupon is the first of its kind to combine the power of Facebook, Google+ and Twitter with the incentive of a discount. More likes and tweets = More sales $$$! Users can add a comment with their Like or G+ for greater exposure. Tested and working with WooCommerce 2.0! No update necessary. Works with any kind of WooCommerce coupons such as free shipping, % off cart, fixed amount off cart value and many more. Share the post "Viral Coupon – Like, Tweet or G+ to get a Discount"